Today I thought I'd play along with the Bring Back Beautiful girls at Flourishes....have you seen this new team? We have some superstars bringing back the beauty in stamping. It's a once a month challenge at Flourishes and this month's theme is *Rustic Beauty*. I love the feeling of fall, and I love to watch the leaves change color. When we lived in the US I saw it in the most variety and glory with the huge maple and oak trees that lined the streets of the city we lived in. And autumn lasted well into November there which was so fun. Though our season is shorter here, it is no less delightful. 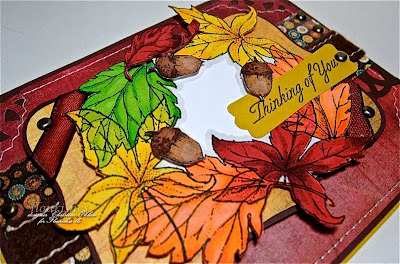 An idea popped into my head about the changing colors of autumn and how I could display that on a card. I decided to make a changing leaves *wreath*. I stamped the leaves from the Falling Leaves Set using Momento Tuxedo Black overlapping each other in an oval shape on Flourishes Classic white. Then I set to work coloring the leaves, using Copic markers. Where the leaves overlap each other I used transitional colors blending both neighbouring colors in those sections. So, green and yellow mixed, yellow and orange, orange and red and back the other direction. That way the overlap looks like a blend of both colors. I trimmed out all my leaves adding some popped up acorns and one other red leaf. I added some fun felt ribbon and some really lovely new taffeta ribbon from Flourishes that is two toned on the edges. Martha Stewart Rings punch on the edges, designer paper from a few Basic Grey packs, some sewing, and some woodgrain texture on the Labels Eight Nestability shape. So, be sure to check out the amazing inspiration from the Bring Back Beautiful Team, and join in on the challenge too! What a creative way to color those leaves!! Beautiful Christine! 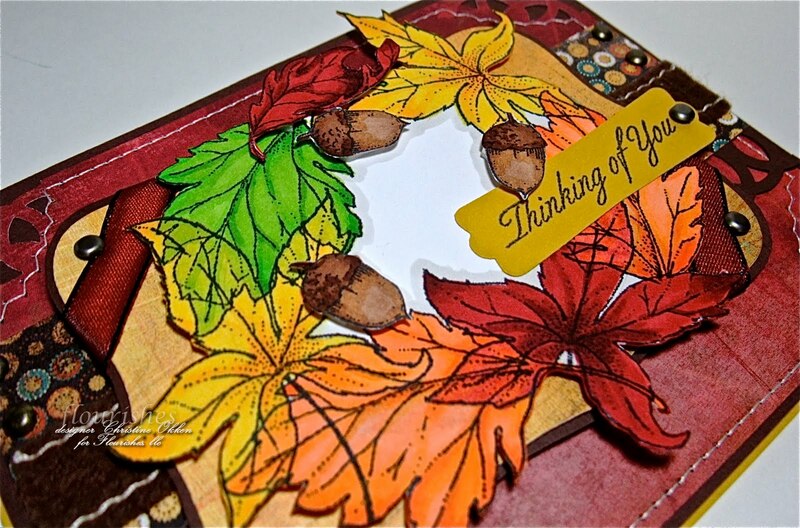 Beautiful fall card, Christine! Love your coloring and the paper you chose. Fantastic colors and the cut work detailing with the leaves and frame are wonderful, Christine! Great looking card! 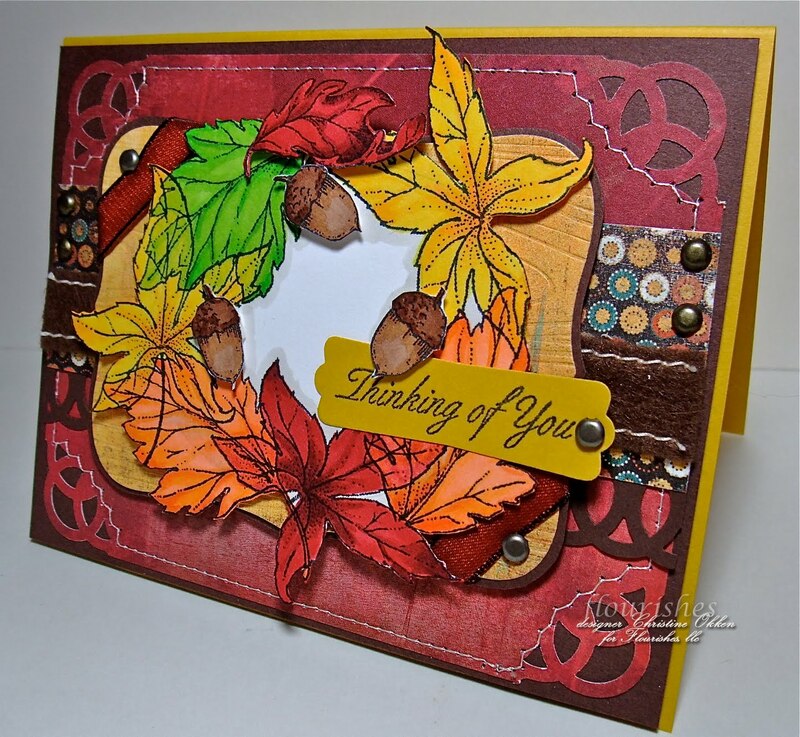 Stunning Fall Creation Christine WOW! Wooo!! Stunning!! You sure captured those rustic, autumny colors. Love this card!! WOW Christine this is just GORGEOUS!!! I just love how you've coloured the leaves!!! We have 1 tree in our street that changes colours - the rest stay green all year round. I can only imagine how spectacular a whole street would look!